We take immense pleasure in extending a voluminous description of our professional abilities blended and support with perfection for your kind perusal. It all begins with TRUST. You need to feel assured that our event / destination management team understands your needs completely. and is backed by a proven record for delivering creative and well managed solutions. Zarsoo Event Management Services (ZEMS) is specialized into Corporate Events & Fairs & Exhibitions and is one of the fastest growing Event Management Company in India, focused on the customer satisfaction and consistently works towards professional triumph. 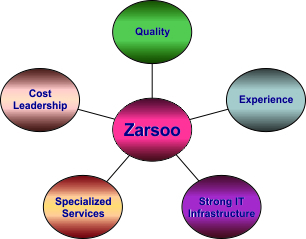 Zarsoo IT Services is an Indian IT company that deals in almost every sector of Information Technology. We provide professional custom solution using our enormous skills and efforts. Zarsoo is India's fast growing Services provider in the sector of Information Technology, Advertising, Event Management and Strategic Planning & Consultation. Here at Zarsoo, we combine the quality services with the best ever after sales services, with the mission that inspires Zarsoo’s every team member is to “Services for Your Dezires”.